For the second consecutive year, the Arkadelphia Badgers are headed to War Memorial Stadium for the 4A State Championship football game. The Badgers defeated Shiloh Christian 30-17 in the semifinals Saturday night at Champions Stadium in Springdale. The win set up a rematch with the Joe T. Robinson Senators this Saturday, December 8, at 6:30 pm at War Memorial Stadium in Little Rock. The Badgers will be facing the Senators in a rematch of the week five game in which the Senators won in Arkadelphia. The loss sent the Badgers to an 0-5 record and would end up being the last loss of the season for the Badgers to this point. Arkadelphia has reeled off nine straight wins on its way to a championship game appearance and a shot at an unprecedented turnaround for an Arkansas high school football team. It is the belief of several high school football experts from around the state that Arkadelphia would be the first team to begin a season 0-5 and go on to win a state championship. The turnaround to this point was possible because the first three games don’t count toward conference standings, but the Badgers did begin the 4A-7 schedule with an 0-2 record before turning things around and finishing 5-2 in league play and earning the 3-seed from the 4A-7. The playoff run has also been one for the books for the Badgers. If the Badgers defeat Robinson Saturday, they will be the first team in the state to win a state championship by defeating four 1-seeds in the playoffs in the same season. Arkadelphia has defeated one-seeds from the 4A-8 (Warren), the 4A-3 (Stuttgart) and the 4A-1 (Shiloh Christian). Joe T. Robinson would be the fourth as the Senators are the 1-seed from the 4A-7. The Arkansas Activities Association announced Monday that no decision on weather-related issues involving this weekend’s championship games will be made until later in the week. The Arkansas Activities Association encourages fans to purchase their tickets from their respective schools the week of the game. One reason is that it helps fans avoid lines at the stadium on game day, but also because each school gets to keep the majority of the proceeds from advance ticket sales the week of the game. 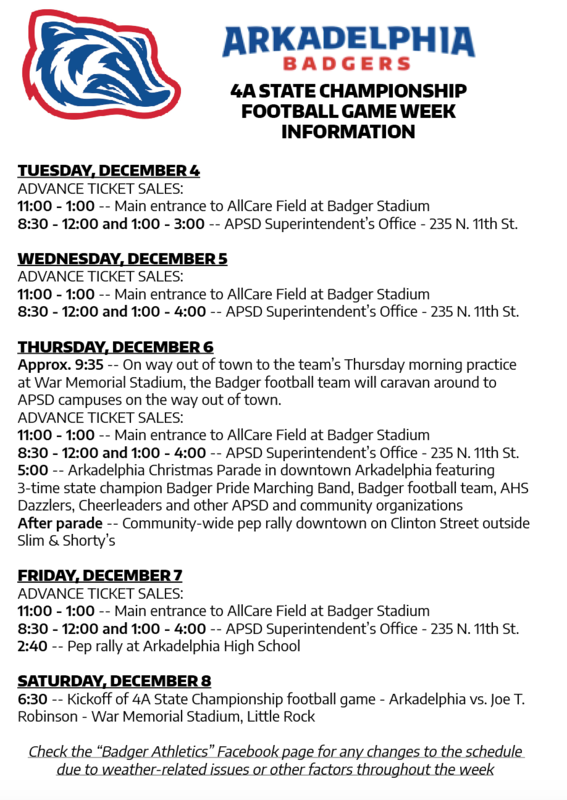 There is a limited number of tickets allotted to each school so take advantage of one of the times listed in the accompanying graphic with the week’s schedule to purchase your tickets. - Prices for advance sale tickets are $7 for adults and $6 for students. - The price at the gate is $7 general admission. - Children ages 5 and up are required to have a ticket. 8:30 am - 12:00 pm and 1:00 pm – 4:00 pm:APSD Superintendent’s Office - 235 North 11thSt. See the attached picture for a schedule of the week’s events. There will be a community-wide pep rally Thursday evening downtown after the Arkadelphia Christmas Parade. There will also be a pep rally at AHS on Friday during the school day. We appreciate the support from our community and hope that these two activities will allow the community to show their Badger pride while also keeping game preparation as normal as it can be in a week like this. - Kickoff is set for 6:30 p.m. for the state championship game between Arkadelphia and Robinson. - A fan bus will be available for Badger fans who wish to attend the game. The cost will be $5 per person. AHS students 9th grade and up may ride alone, but any students 8th grade and below must be with an adult. Fans may sign up in the Arkadelphia High School office from 8:00 am through 3:00 pm Tuesday through Friday. A minimum number of fans will be required in order for the bus to make the trip. - Parking will be $5 per vehicle and the east parking lot will be the best lot for Badger fans to park with the Badgers being the visiting team. - Tailgating is allowed in the WMS parking lot. Join the Badger fans who are planning to start the day with pregame tailgating at WMS. Keep in mind that the Badgers will be playing the second game of the day so fans from the 3A State Championship game will already be in the parking lot. - Gates will open at 5:00 p.m.
- Arkadelphia will be the visiting team in the game and Badger fans will sit on the East side of War Memorial Stadium opposite the press box. 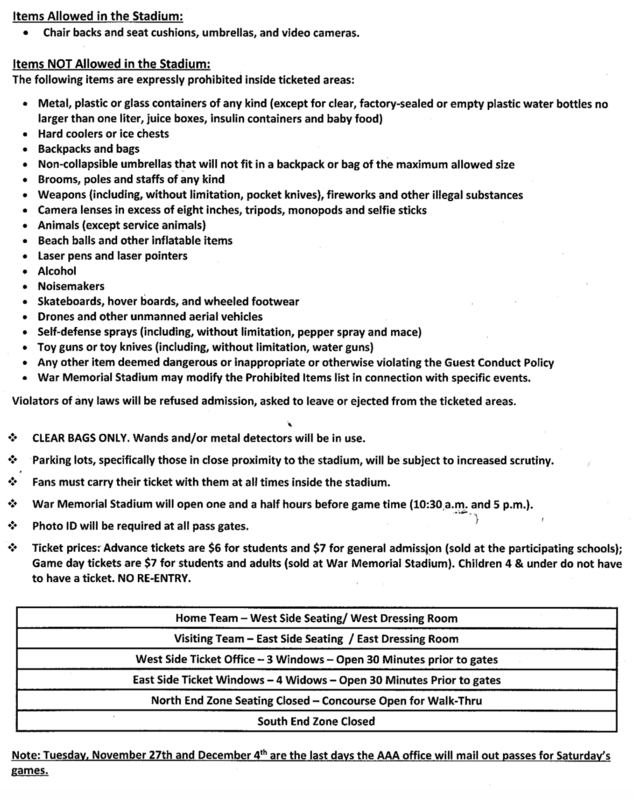 - Badger fans will enter War Memorial Stadium through Gate 1 also on the East Side of WMS. - Badger fans who cannot purchase ticket in advance and need to purchase tickets on game day may do so from the East Side ticket Windows which will open at 4:30 pm. - INDIVIDUAL WALK-THROUGH METAL DETECTORS WILL BE IN USE SATURDAY. Fans will want to allow additional time to enter gates as this process is slower than what fans experienced last year at the championship game. 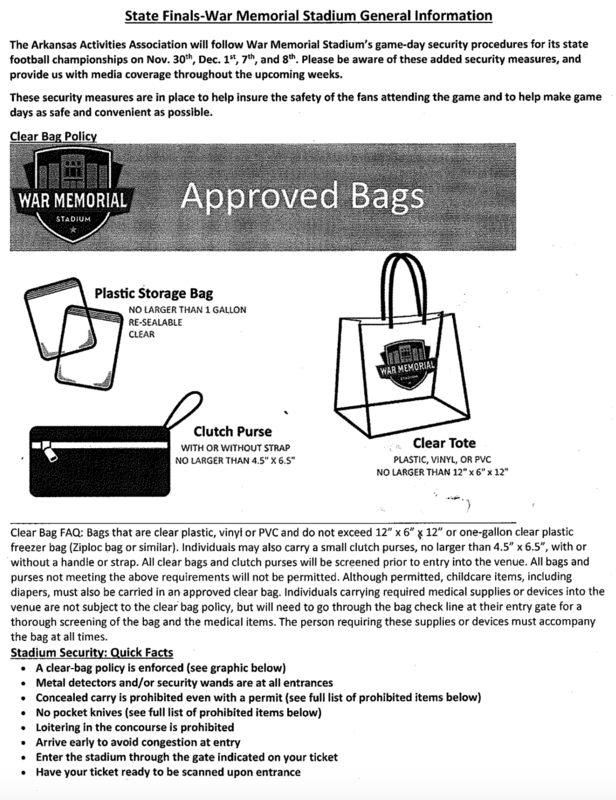 - Chair back seats, seat cushions, umbrellas and video cameras WILL BE ALLOWED into the game. For those who cannot attend the game, the game can be viewed on AETN Channel 2 around the state of Arkansas through a production of AETN Sports and the Arkansas Activities Association. The Arkadelphia Badger Radio Broadcast with Dr. Jeff Root can also be heard on KDEL 100.9 FM, KYXK 106.9 FM and through an audio-only broadcast online at www.arkadelphiabadgertv.com. Due to AAA television rights going through AETN Sports and the NFHS Network, Arkadelphia will not be able to livestream the game with video through ArkadelphiaBadgerTV.com or on the Mascot Media app.